Boxing promoter Frank Warren has told the High Court that undefeated world champion Joe Calzaghe owes him £1m for breaking a verbal contract. Mr Warren denies the claim by the boxer he once managed of having persuaded him to sign deals under duress and having had a conflict of interest. His legal team said the fighter decided he could work "without a promoter". The Welsh boxer, who has announced his retirement, is counter claiming that he is owed up to £2m in unpaid fees. Mr Warren's barrister, Ronald Thwaites QC, told the court on Monday the boxer was claiming that Mr Warren, through his company Sports Network, had managed to persuade him to sign contracts under duress while he was suffering dehydration and hunger preparing for fights. 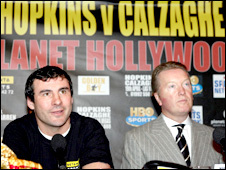 Mr Calzaghe, from Newbridge, south Wales, a former BBC Sports Personality of the Year, was also claiming that there was a conflict of interests while he was managed by Mr Warren because Sports Network was also promoting the fights. Mr Twaites said: "We can demonstrate that that is untrue. "What has happened is, instead of doing what he knew best, Mr Calzaghe thought - in a career having been successfully managed and promoted for over 10 years and having earned in excess of £16m in purse money - that promoting a fight was simplicity itself and he could do it without a promoter. "A boxer is not a promoter." Mr Thwaites said Mr Warren's fight contracts with Mr Calzaghe were always scrutinised by the boxer's solicitors and Mr Warren would only receive his promotion fee if he promoted fights and only once took a management fee when he was not the promoter. After showing a series of the contracts to the judge, Mr Justice Wyn Williams, Mr Thwaites said: "These documents successfully contradict Mr Calzaghe's claim that he was a naive person taken advantage of over conflicts of interest of which he had no understanding until very recently." The boxer, who has retired from the ring as undefeated world super-middleweight champion, denies there was a verbal contract to continue boxing for Mr Warren and is counterclaiming he is owed more than £2m in fees for his Bernard Hopkins win in 2008. Mr Thwaites said Mr Calzaghe had agreed verbally at a meeting in London in 2008 to allow Sports Network exclusively to promote his remaining fights. But he said the boxer split from Mr Warren and himself promoted his last fight against Roy Jones Jnr in July 2008. "Mr Calzaghe earned far less than he would have done if the fight had been promoted properly by the claimant," said Mr Thwaites. He said Mr Warren had been offered £2.5m for the television rights for two Calzaghe fights. "If Mr Calzaghe wanted to have the benefit of that, then he had to agree to be promoted for a further fight," said Mr Thwaites. The case, which is expected to last for up to six days, continues on Tuesday. Mr Warren and Mr Calzaghe shared the same front bench of the court - Mr Warren at one end and Mr Calzaghe at the other, separated by their teams of lawyers.